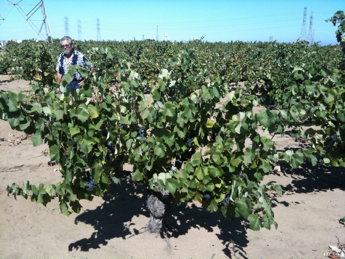 The Ventana Vineyard, located in the cobbled soils of the Arroyo Secco AVA, is home to some of the oldest Chenin Blanc vines left in California. These old, un-grafted vines planted in a wash of river stones can produce wines that are pure, transparent and authentic in every way. The pervasive winds of the Salinas Valley keep the temperature cool and moderate deleterious heat spikes that can cause grapes to become out of balance in flavor and chemistry. This near-perfect environment for Chenin Blanc allows us a long growing season, and one that gives us a good window of ripeness from which to pick. We picked our Chenin Blanc on October 4, at 21.7 brix with great natural acidity (pH 3.21/ TA 7.8 g/L). Roughly half the fruit had colored from green to gold (a trait particular to Chenin Blanc), giving us a good mix of flavor and texture. We chose to whole-cluster press our Chenin Blanc, adding the grapes directly to the press with no crushing or de-stemming. This gave us moderately clean juice the next day which was transferred to older French oak and a stainless steel drum. Indigenous yeast activity became apparent after a few days and took just over 2 months to complete. A natural malo-lactic fermentation ensued. The stainless steel drum was racked to a older French barrel in the following March as it was less developed and begged for the slow-ox provided by oak. The wine was racked clean to tank in late July. Fining and filtration trials proved detrimental to the quality of the wine, as such we bottled 49 cases of 750 mLs and 4.5 cases of magnums unfined and unfiltered on August 12, 2011. A homeopathic quantity of sulfur was added post MLF and at bottling. Clear, near green-gold in color with aromas of citrus, green apple and honeycomb. There is a distinct freshness and minerality to the texture. 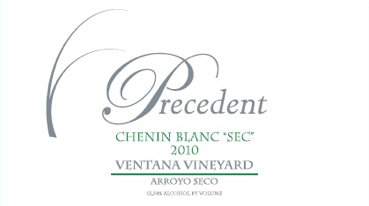 Bright acidity with medium weight, this is a classic rendition of dry Chenin Blanc that drinks well in its youth, but has enough nerve to merit some cellar time.